. This wasn’t a surprise to me, but for those who haven’t heard of his antics, this wait probably felt like an eternity. 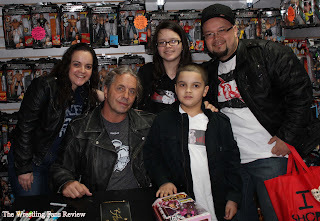 When we final got to meet Bret, for the first time ever we were rushed through the line and it was understandable, because there was about 300 people waiting. So I don’t hold anything against the Wrestling Universe. Bert Hart signed my WCW World title and a Ringside Collectibles Exclusive Mattel Elite collection action figure. Jillian Hall was great she signed an action figure and a promo picture. Sadly I will not be attending their next autograph session, because I will be in Monroe New Jersey with my bro and the Bella Twins. But I will try to attend his next session; he will have Don Muraco, Jimmy Snuka, & Val Venis. To be honest I am only going for Val, I just want him to say “Hello Ladies” on my cell phone and make it my new ring tone…lol until next time see you in the line.